Alysha and Ben Kellner consider themselves lucky – very, very lucky. Today, they are the proud parents of a healthy, happy 11-month-old daughter named Kora, derived from Corazon, the Spanish word for heart. While that may not seem unusual, it was a journey that defied all odds. During Alysha’s 23rd week of pregnancy, their unborn daughter was diagnosed with a rare tumor growing on her heart. Fewer than one in a million babies develop this type of tumor – called a fetal pericardial teratoma – which often results in death. Luckily, the Kellners were referred to the Midwest Fetal Care Center, a collaboration of Children’s Minnesota and Allina Health. There they met Dr. Joseph Lillegard, a pediatric surgeon and leader of the Center’s open fetal surgery program, who told them about the possibility of performing in-utero surgery to remove the tumor. Along with the hope they felt at learning about the procedure came a dash of reality – fetal surgery to remove the type of tumor growing on their baby’s heart had only previously been performed successfully three times in the world. To prepare for the surgery, Dr. Lillegard and the Center’s medical team consulted with physicians at the Children’s Hospital of Philadelphia, which had conducted the three successful previous surgeries. They also gathered a team of more than a dozen specialists and ran thru various simulations. On July 31, 2017, Dr. Lillegard, Dr. Francis Moga, a cardiovascular surgeon at Children’s Minnesota, and a team of maternal fetal specialists made small incisions into Alysha’s abdomen and uterus to expose the baby’s chest and found the tumor, which was four times larger than the heart. Using tiny, specialized surgical tools, they were able to remove 90 percent of the tumor before closing up the incisions. On September 29, 2017, nearly two months after her fetal surgery, baby Kora was born at 35 weeks via C-section. Kora spent 42 days in the hospital and had another surgery to remove the remainder of the tumor. 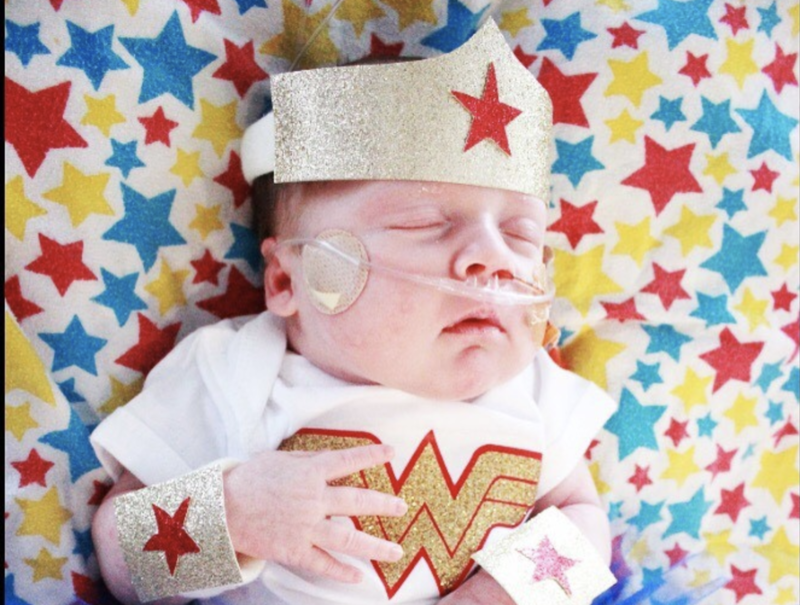 On Halloween the hospital staff were delighted to see the tiny fighter dressed as Wonder Woman. Today, Kora is cancer-free and enjoying all the wonders of her parents’ home. On October 14th, Kora and her parents will welcome participants at second annual Great Candy Run Minneapolis. The Great Candy Run is a family-friendly 5K run/walk with lots of sweet extras including a free fun run for little ones, entertainment, costume contests, prize money, medals for all finishers, refreshments, Lolli’s Candy Shoppe and a festival featuring games, activities and amazing face painting. Presented by Midwest Fetal Care Center, proceeds from The Great Candy Run Minneapolis benefit the nonprofit Fetal Health Foundation (FHF). FHF supports families around the world who receive a fetal syndrome diagnosis, funds life-saving research, increases fetal syndrome awareness, and shares leading medical information on fetal syndromes. Register online for The Great Candy Run Minneapolis, which takes place on Sunday, October 14th at Veterans Park in Richfield. The Midwest Fetal Care Center is the first and largest advanced fetal care program in the Upper Midwest. The Center was formally established in 2008 as a collaboration between Children’s Minnesota, Abbott Northwestern Hospital and Minnesota Perinatal Physicians, along with Pediatric Surgical Associates and other consulting subspecialists for the diagnosis, consultation and treatment of fetuses with developmental abnormalities. It is the first and largest advanced fetal care program in the Upper Midwest. Abbott Northwestern and Minnesota Perinatal Physicians are part of Allina Health. Founded in 2006, the Fetal Health Foundation is a leader nationally and internationally in supporting families and medical treatment centers dealing with intrauterine fetal syndromes. The 501c3 nonprofit organization connects families diagnosed with a fetal condition to top-rated medical specialists, provides information, financial support, connections and counseling. In addition, FHF funds research, increases awareness, and serves as an outlet for leading medical information pertaining to fetal conditions and syndromes. The Great Candy Run (GCR) is the Foundation’s primary fundraiser.